This is a side view of Mission San Jose in San Antonio, TX. Most folks are familiar with The Alamo, but don't realize that it was originally a Spanish mission and that there are four more strung along the San Antonio River, snaking their way south from downtown and that collectively they constitute a National Historic Park. 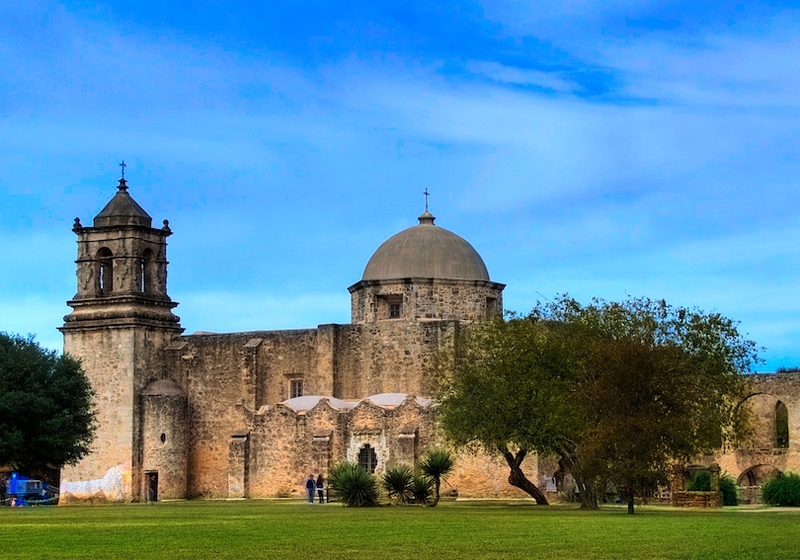 Mission San Jose is often referred to as the "Queen of the Missions" and was not only the most prosperous and a model for future missions, but also a social and cultural center. On this day the weather was very cooperative, leaving me with clear blue skies and light clouds, but the front facade was undergoing some restoration (see the blue scaffolding truck on the left?) and that prevented me from getting a rocking cool shot of the full front, which is beautiful and artfully adorned. Oh well, you get what you get and you don't throw a fit.